Here’s a post I’m gonna brag about. I love the pictures. I love how easy the recipe is. And I really love how it tastes. 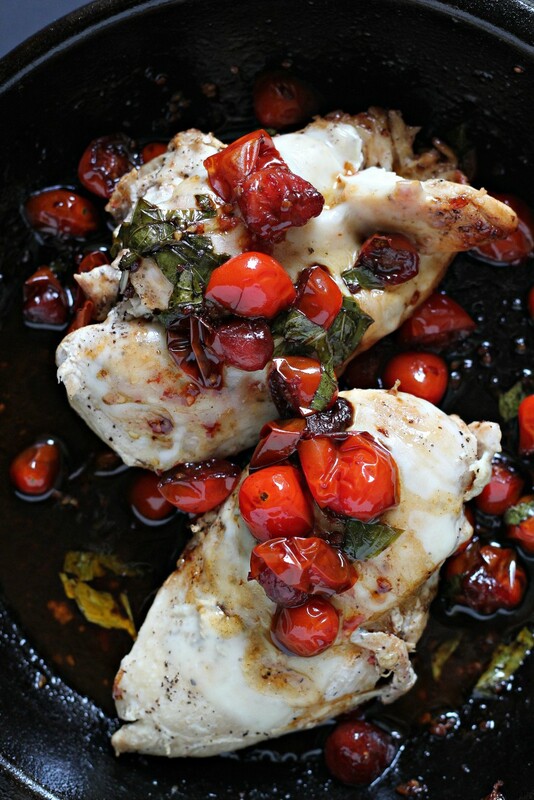 It’s a Paleo Balsamic Chicken Recipe, with cherry tomatoes, garlic, fresh basil, anddd mozzarella. Here’s why I’m allowed to brag about this recipe. Because I didn’t actually come up with it, my roommate made it a few times and then I asked her if I could politely use it for my blog. She said yes, which gives me bragging rights, right? Let me talk you through the recipe. If you look below I will give you exact measurements for two-three people, but for now here’s the basics. You cook chicken on the stove, preferably in a cast iron skillet. Then you remove the chicken and add balsamic vinegar to fill that skillet. Then you throw in some cherry tomatoes, garlic, basil, and salt. Don’t forget the salt. Then you let that cook, and let the cherry tomatoes cook down. Then you add back the chicken breasts, top it with some mozzarella and cover the pan to allow it to steam. Throw the cherry tomatoes and balsamic “sauce” on top, and serve hot, hot, hot. Actually I ate it cold the next day and that was pretty good too. This recipe is a keeper. One that I see myself making one night a week! Less than 2o minutes to cook, and it can be adjusted for how many people you are serving. Want to make it for 5 or 6 people? Just use a bigger cast iron, and get more of each ingredient. The recipe below is for two-three people. My chicken breasts were almost 1/2 pound each, so I could get 2-4 meals out of this. Depending on who’s eating it! a meal that takes less than 20 minutes to make and comes out perfect! Add oil to cover the cast iron skillet and bring to medium heat. Season the chicken breasts with salt and pepper. Cook chicken in the skillet, covered, for about 6-8 minutes on each side. Remove the chicken and place on a plate. Add balsamic and bring the heat to medium-low heat. Add the cherry tomatoes and toss them with a slotted spoon. Cook for about 5 minutes. Halfway through the 5 minutes add basil, garlic, and salt and mix with the spoon. Add back in the chicken breasts and place the sliced mozzarella on top. Cover the skillet to assure the cheese melts. 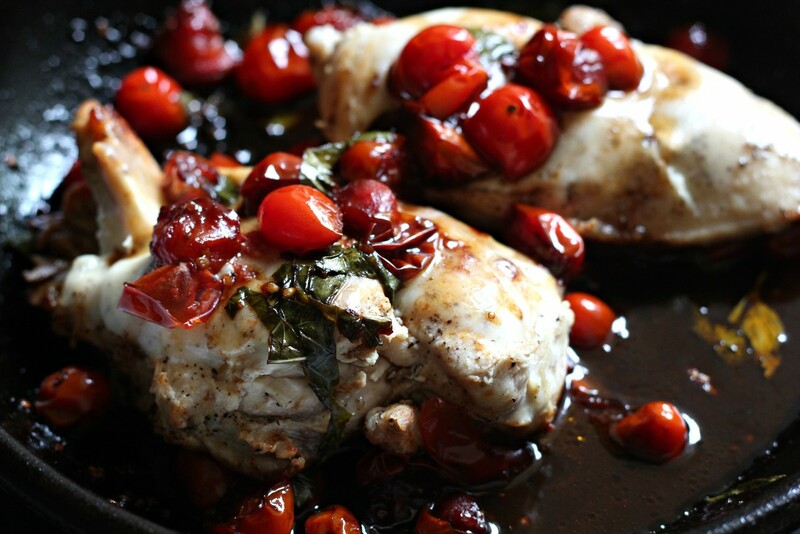 Top each breast with the balsamic "sauce" with tomatoes, and serve hot!